Lustron houses are prefabricated enameled steel houses developed in the post-World War II era United States in response to the shortage of homes for returning GIs. Considered low-maintenance and extremely durable, it was expected to attract modern families who might not have the time or interest in repairing and painting conventional wood and plaster houses. In January 1947, the newly formed Lustron Corporation announced that it had received a $12.5-million Reconstruction Finance Corporation loan to manufacture mass-produced prefabricated homes that featured enamel-coated steel panels (U.S. Patent 2,416,240). Strandlund's Lustron Corporation, a division of the Chicago Vitreous Enamel Corporation, set out to construct 15,000 homes in 1947 and 30,000 in 1948. From its plant in Columbus, Ohio (the former Curtiss-Wright factory), the corporation eventually constructed 2,498 Lustron homes between 1948 and 1950. Most of the known Lustron houses were constructed in 36 of the United States including Alaska. However, some were constructed in Venezuela, South America for families of oil industry employees. The Lustron design was created to adapt it to mass production. A steel framing system was devised consisting of vertical steel studs and roof-ceiling trusses to which all interior and exterior panels were attached. Lustron homes were usually built on concrete slab foundations with no basement. However, about 40 Lustron homes have been reported to have basements. 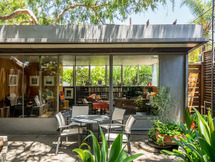 Their sturdy steel frame was constructed on-site and the house was assembled piece-by-piece from a special Lustron Corporation delivery truck. The Ohio Historic Preservation Office recognizes four exterior colors: "Surf Blue," "Dove Gray," "Maize Yellow," and "Desert Tan." Reported in error over the years is that Blue-Green, Green, Pink, and White were available. Window surrounds were primarily ivory-colored, although early models used yellow trim on "Surf Blue" models. The interiors were designed with an eye toward the modern age, space-saving, and ease of cleaning. All Lustrons had metal-paneled interior walls that were most often gray. To maximize space, all interior rooms and closets featured pocket doors. All models featured metal cabinetry, a service and storage area, and metal ceiling tiles. In the Westchester Deluxe models, the living room and master bedrooms featured built-in wall units. As an added option, customers were presented with the unique Thor-brand combination clothes- and dish-washer, which incorporated the kitchen sink. There are two major window types in Lustron homes: “tripartite” and casement, all manufactured by Reynolds Aluminum. The tripartite consisted of a central light flanked by two four-light casement windows. Three-light and/or square aluminum casements with interior screens were standard on all Lustrons. Add-on storm windows were available for residents in colder climates. The roof likewise consisted of porcelain-enameled steel tiles, which were installed shingle-style. 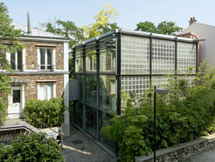 The front and rear doors featured a single light of translucent, rippled glass. As seen in the chart above, floors in the Westchester Deluxe models were asphalt tile, but in other models, floors were installed as a “builder's option. In most models, the homes were heated with an oil burning furnace that directed hot air into an enclosed space above the metal ceilings. The walls contained a one-inch blanket of fiberglass wool insulation. Later production models of the Newport use a forced-air system. The Lustron Corporation declared bankruptcy in 1950, despite being an extremely well funded, well-publicized, government-supported enterprise manufacturing a desperately needed product. Production delays, the lack of a viable distribution strategy, and the escalating prices for the finished product all contributed to the failure. Additionally, local zoning codes also played a part. In some municipalities, for example, an ordinance prohibited homes with steel chimneys. Some accounts suggest an organized effort from the existing housing industry to stop Strandlund, comparing him to Preston Tucker (ironic, because Strandlund's first choice for the Lustron factory building, the Dodge Chicago Aircraft Engine Plant in Illinois, was actually granted to Tucker to build his automobiles). About 2,000 Lustron homes are still in existence in 36 states. Many have been modified with additions, remodeled kitchens, vinyl windows, composite roofs, new heating systems, sheet rock interior walls, painted exteriors, and siding. Some have been dismantled, relocated and reassembled. A small group of Lustron owners are preserving the original condition of their homes and are urging others to do the same, and a significant number of entirely original Lustron homes exist. Demolition continues to threaten Lustrons where rising property values attract buyers who desire larger homes of newer construction. Other major threats to Lustron homes' integrity include: severe weather (tornadoes, hurricanes), vehicular or other impact, and lack of local zoning/preservation/aesthetic legislation.